Hearts make the short trip across the capital to take on rivals Hibernian on Tuesday night and Ladbrokes are offering a crazy 33/1 price boost for ANY goal to be scored in the Edinburgh derby! Money back if it ends 0-0! Get a massive 33/1 on a goal to be scored in the Hibs vs Hearts game. This bet is normally available at 1/25! All you need to do is sign-up to a new Ladbrokes account. 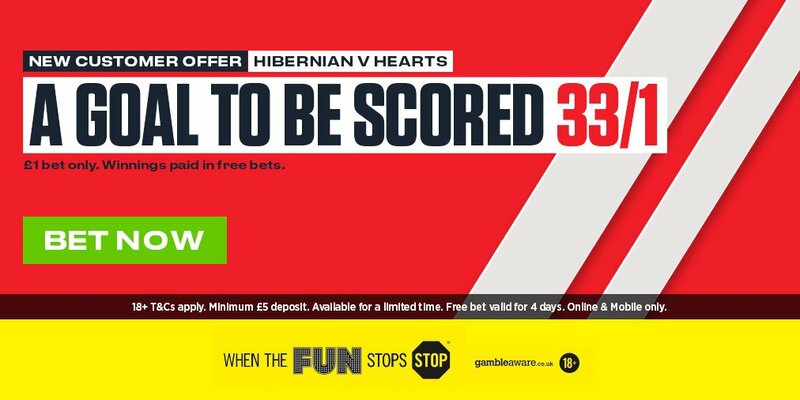 Join Ladbrokes via our special links and claim 25/1 for a goal to be scored in Hibernian v Hearts! 3) Place a single bet of up to €/£1 on ANY goal to be scored in the Hibernian v Hearts game before the kick-off. 4) If a goal is scored, your account will be credited with extra winning to make payout equivalent to enhanced odds within 24 hours. 2. Bets placed in accordance with the terms and conditions will be eligible for the enhanced odds of 33/1 on a goal to be scored. Maximum one qualifying bet per customer. 3. If the bet loses, we will refund your stake up to £1 as a free bet, paid into your account within 24 hours. 4. This offer is available from 08:00 on Monday 23rd October 2017 until 19:45 on Tuesday 24th October 2017. 7. We cannot accept new customers from, or offer this promotion in, certain countries - see here for Restricted Territories. 8. Winning bets will be settled at the standard price and the additional winnings from the enhanced price paid into your account within 24 hours. The extra winnings will be paid as a free bet token. "Claim 33/1 A goal to be scored in Hibernian v Hearts at Ladbrokes"